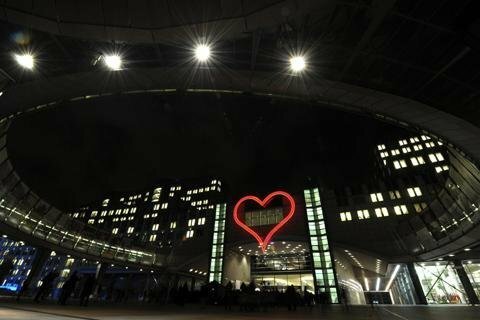 A giant pink neon heart now adorns the European Parliament building in Brussels in memory of the late dissident playwright and Czech president Vaclav Havel, who died last year. Vaclav Havel’s Czech fans are encouraging people to roll up their trouser legs in a comic gesture to honor Havel. As Czech president, Vaclav Havel wore trousers which were “noticeably short”, the trouser campaign website says. Vaclav Havel was widely admired for his long struggle against communist repression. The trouser gesture is “humorous, non-violent but significant and perhaps even very Czech-like”, the campaign group says. The neon heart in Brussels, measuring 15 m by 17 m (50 ft x 56 ft), adorned the facade of Prague Castle before the end of Havel´s second presidential term in December 2002. Its creator, Jiri David, was inspired by a small, hand-written heart which Vaclav Havel used to place after his signature, a statement from MEPs in the European Conservatives and Reformists (ECR) Group says. It is described as a symbol of Vaclav Havel’s commitment to human rights, peace and democracy. Vaclav Havel died at the age of 75, having guided Czechs and Slovaks through the turbulent 1989 Velvet Revolution and democratic transformation. He was elected Czechoslovak president in December 1989, then led the Czech Republic after the split with Slovakia. Supporters of the late Ahmed Shah Masood, a resistance fighter who led opposition to the Afghan Taliban, plan to transport the neon heart to Kabul next September to honor Masood, who was assassinated on 9 September 2001. Al-Qaeda and the Taliban were blamed for the bomb blast which killed him.